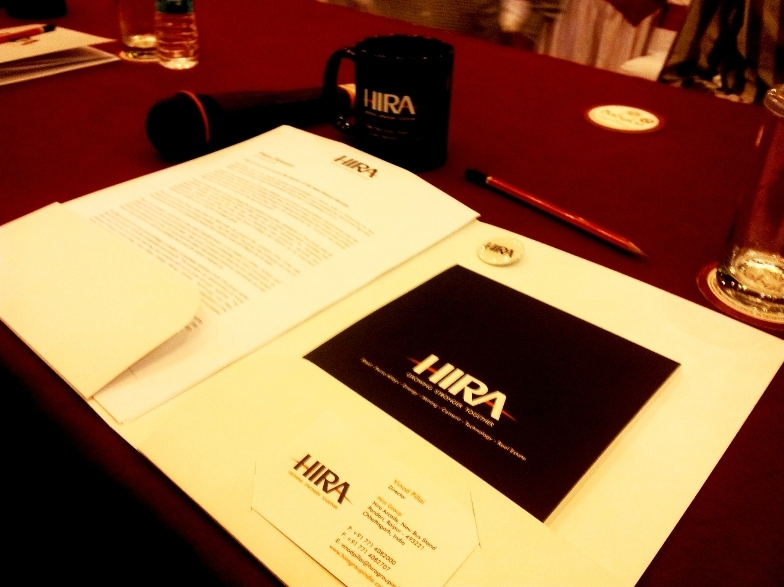 Hira Group, one of the largest industrial conglomerates in Central India is introducing its new brand identity today. The launch of the new group identity, which includes the new group logo and tagline, is part of a major brand transformation the group is undertaking in 2013. As part of the rebranding, you will see changes on all brand communication touch points over the next few months. The first major change is the new Hira Group Logo, which brings a lot of focus on the brand name ‘Hira’ with an arc cutting through it creating an umbrella that covers and unites all the group companies under it. The arc also brings into perspective the ‘horizon’ that allows Hira Group to set itself a vision for the next real growth. The new brand identity will not change the successful business operations of the group and its companies, rather it will reinforce a more unified approach to doing sustainable business that results in stronger growth for all. The new identity will further leverage the recognition, capabilities, strength and scale of Hira Group in delivering new products, services and technologies for our customers. We see our new brand strategy and identity as an important contributor to attaining our long-term strategic goals. The origin of Hira Group dates back to 1965 when the group’s first company Hira Tyres was setup as an automobile tyre trading company. Over the years, the group has emerged as one of the strongest and the most respected brands from Central India with Raipur as its base. One of the strategic objectives of the brand transformation is to create a unified, holistic and integrated brand experience and culture across all 14 group companies and Hira Foundation, by 2015 when Hira Group completes 50 years. Each group company will have its own identity which will also be redesigned to bring it in tune with the latest international branding standards but will have a clear connection with the umbrella brand and the values it stands for. An integral part of the new brand strategy is creation of business verticals under the group rather than focusing only on individual companies and products. This will allow our stakeholders to know more about the work we do and how they can combine with us to grow stronger together. The business verticals include Steel, Ferro Alloys, Energy, Mining, Cement, Technology and Real Estate. These verticals interact with each other to create forward and backward integration in the our businesses which is a unique proposition of Hira Group and one that gets best communicated through the new group tagline – Growing Stronger Together. The new tagline is an outcome of an extensive research conducted over the last two months. During the research, all members of the Board and employees from different levels of the organization were interviewed to understand the DNA and core values of the group. The research also involved collecting inputs from customers, investors and the local community of Raipur. The tagline clearly communicates the group’s focus on Growth rather than striving to only become a Leader. The group believes in real and sustainable growth that is truly inclusive benefitting Customers, Employees, Employees, Community and the Environment. Hira Group first realized the need for a comprehensive rebranding exercise in 2012 and in the first quarter of 2013, they called several branding agencies to present their case for the rebranding assignment. After several rounds of discussions and presentations, the contract was finally awarded to New Delhi based Brands of Desire, a strategic brand consulting and design company that has several years of experience working with group branding assignments in India and Internationally offering a complete spectrum of branding solutions leading to an effective and consistent use of Brand Communications. The complete transition from the current branding to the new brand identity will be completed over the next six months. Upon successful completion, the new brand will be visible across all the brand touch points including marketing communications, group companies and their communication, internal environments including offices and factories of Hira Group, digital spaces (website, social media), CSR and corporate communications.